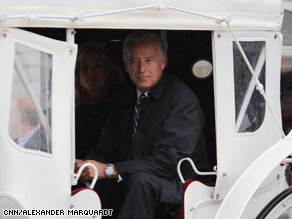 Vice President-elect Joe Biden rides in a horse drawn carriage during Delaware’s Return Day. “The bad news for you is Jill and I are not leaving Delaware,” he continued. “I may be the Vice President-elect but we’re going to be home every weekend so you know where we live. Biden stood for two hours at the front of a review stand watching floats, marching bands and cars carrying past and current elected officials go by, chatting all the while with his wife and longtime friend Rep. Mike Castle. “This is the coolest event in the entire United States of America,” Biden told a small group of reporters on the flight to Delaware Thursday morning, proceeding to spend the bulk of a 40-minute chat at the back of the plane recounting the history of the day and discussing state politics. Return Day culminates with Republican and Democratic Party representatives jointly burying a tomahawk from the Nanticoke Indian tribe in a glass aquarium full of sand from Delaware’s Lewis Beach. The bi-partisan tradition is meant to symbolize the end of hard-fought campaigns. Asked where O'Donnell was, Biden pointed to the carriage seat in front of him and told CNN, "I don't know, she was supposed to be here." Biden staffers said they did see her at the event but it is unclear why she didn’t join the Delaware senator in his carriage. The future vice president's schedule forced him to leave before the actual burying of the hatchet, he is now back in Chicago and will hold a press conference with President-elect Obama on Friday, their first since winning the election. Joe Biden is a Whoot-Love em! Joe "The Vice President Elect"!! Just a tad better than "Tito the builder", Huh?? Love this guy. Im not an American, but find his story very inspiring. Congratulations Joe. Hey Red: If you had a clue you would realize ti was the community reinvestment act that put us in the financial situation we are in. It makes a lot of sense to lend money to people who cant make the payments doesnt it? And if I recall didnt that take place during the Clinton years? And werent Barney Frank and Chris Dodd the Chairs of the Senate and House banking committees? Blaming this on Bush is a convenient lie for the demoncrats. But the real blame belongs to the leniency of bad loans required by community reinvestment act whic was democrat policy with no oversight by the lazy Frank and Dodd. So Red put blame where it belongs. Obama/Biden, the era of dumb and dumber begins. I'm counting down the day's to '12. Hey, "Uh huh", "Judy from PA", and "Olivia" – you three need to get a room. McCain lost – get over it!